Addis Ababa: An Ethiopian rebel leader has been given a triumphant welcome back to Addis Ababa after abandoning his armed struggle and returning from arch rival Eritrea along with several hundred men, officials said on Wednesday. General Mola Asgedom, leader of the Tigray Peoples Democratic Movement (TPDM), crossed into neighbouring Sudan from Eritrea along with 700 rebels on the weekend, and was reported to have fought with Eritrean troops as he fled. “Bringing about good governance and democracy to Ethiopia were the main objective of our armed struggle. But we decided to abandon our armed struggle because we have come to realise that the Ethiopian government is currently working towards that,” the rebel leader told Ethiopian media in comments broadcast late on Tuesday. Mola said he had been living in Eritrea and had received an allowance of 1,500 euros from the Asmara government, as well as a villa and four cars, but said he had begun working as an Ethiopian government mole a year ago. “We have also come to realise the economic progress Ethiopia has achieved and the destabilising agenda espoused by the Eritrean regime and other groups,” he said. The defection was presented by Ethiopian officials and media as a major victory against Eritrea, which broke away from Addis Ababa in 1993 after a long and bitter independence struggle. 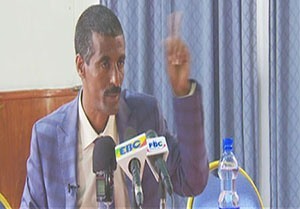 “Mola and his other patriotic friends have not only played a big role in thwarting the destructive mission they were given by the Eritrean government, in supporting the National Intelligence and Security Service to take precautionary measures by providing information, and in feeding timely information about the anti-Ethiopia activities in Eritrea,” a joint statement from Ethiopia’s security and intelligence service said.